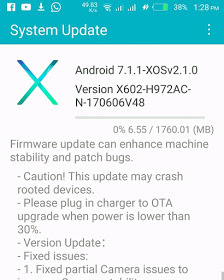 Just recently after Infinix mobility rolled out Android 7.0 Nougat to the Hot 4 users; they've yet rolled out another Android 7.1.1 Nougat update to the Zero 4 Plus users. They kept to their promise, and here it is. As always, the update will be arriving Over-The-Air (OTA), and it weighs in at about 1.67GB. So, you need a good network connection to perform the upgrade, or better still, connect to a fast Wi-Fi network. Before you perform the upgrade, make sure you unroot your phone if it's rooted so to avoid bricking the device. Below is the guide to start the upgrade if it's available for your Zero 4 Plus. >> Go to Settings from your phone. >> Tap on "About Phone". >> Tap on "System Update". >> Now, tap on "Download and Install". >> Your phone will be rebooted to install the new OS. And when it's done, you will now have a feel of Android 7.1.1 Nougat with latest XOS chameleon v2.1. If on the offchance you haven't received an OTA notification notifying you of the Nougat update, then you have to chill until it gets to your device. if i upgrade my software will it do more tasks? It should perform more better as it got a good RAM. permit me the liberty of sharing a usefull apk I gotwhile surfing the internet.there is an app out there on Google Play Store but I am going show you guys on how to send free SMS using elanol app so with this app you will spend #0 to send Messages to people anymore.FEATURES OF ELANOL APP✔️300 words message capacity✔️Offline message receiving✔️List Contacts.✔️Can be use for business✔️Zero Naira charge (N0.0)✔️Available for All network (allnetwork is eligible)HOW TO USE ELANOL APP✔️Download Elanol Apk App from play store ✔️After successful installation, open the App and click on Sign-up✔️Click on Quick Account✔️Fill the Form showed to you and click Create✔️Now you are done with the sign-up. Locate the contact you want to send message or click on the Send Icon sign to write the number you want to send message but remember to start the number with0and not eg (0906and not 23490) and click on it and type your messages. Now click the plus ➕ sign button to send your message.THINGSTO NOTE ABOUT ELANOL APPActually everything good must have a bad side and the bad side of Elanol Appis that it cannot be used offline (ifyou don't have Data connection in your phone, you can not makeuse of it to send SMS). Always remember that once you have data connection on your phone, you can send messages to offline user's eg Nokia Torch users and they will receive your message successfully.let keep educating each other.thanks for the approval. Not just cracking but the network is right inside the PINs. Thanks for the update i think i gonna foward this link to my cousin who want to udgrade his infinix phone.thanks for the udgrade. Pls kachi does upgrading of phone increase the phone storage and version.